Editors' note: A photo is associated with this press release. Cafection launches the world's first internet connected touchscreen coffee maker Innovation Series. A new interactive Office coffee brewing experience with remote management capabilities that includes customizable messaging and only produces biodegradable waste. Cafection Inc. today announced the launch of the world's first interactive and Internet-connected automated fresh coffee dispensers: the Cafection Innovation Series Total 1 and Total Lite bean to cup coffee brewers. The new technology enhances the automated coffee brewing experience as coffee lovers can now enjoy customized interactive content while their hot beverage is prepared. The Innovation Series promises to revolutionize the automated coffee machine industry as the technology and remote management software were designed to increase operators' net margins by at least 66% and reduce maintenance and service costs by 60%. Aside from providing consumers with the best coffee brewing experience, The Total 1 and Total Lite also contribute to global sustainability efforts. Using only biodegradable supplies, Cafection's full line of coffee brewers help organizations reach their sustainability objectives by effectively reducing the enormous amounts of waste currently produced by coffee consumption. "It's a coffee maker, a communications center, a remote management system, and a sustainability catalyst all in one, " said Frank Baron, President of Cafection Inc., "We've turned the 30-40 seconds it takes for fresh coffee to be brewed into a feature for both consumers and operators that's completely customizable based on the location of the coffee brewer." 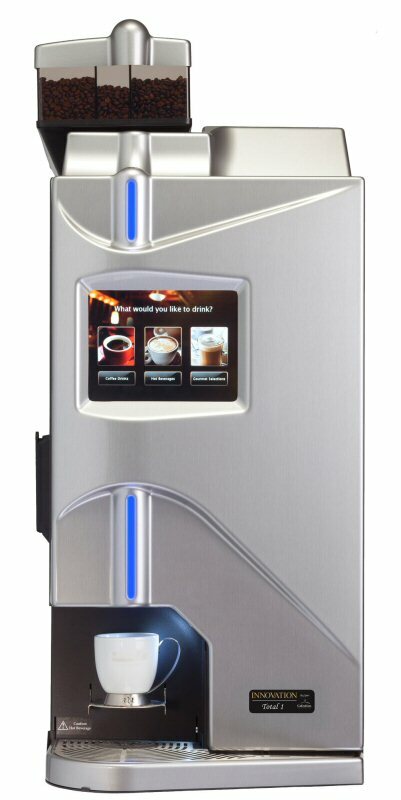 The Cafection Innovation Series touchscreen allows for easy coffee selection and has the capacity to display internal news, personalized videos, and virtually any other kind of interactive content while the coffee is being brewed. Offices, Hotels and C-stores can also customize the content for their environment to effectively communicate any message desired. "The Innovation Series is revolutionary for consumers. Not only does it allow them to choose from over 100 combinations of hot beverages, including fresh lattes, at the touch of a finger," said Denis Maillé, Cafection's SVP & COO, "but it's also revolutionary for our partners who can offer their partners a unique coffee experience system that can be managed remotely to diagnose the machines, as well as track sales and inventories." The Innovation Series is available through Cafection's network of partners. Visit www.cafectioninnovation.com for more information. Cafection Inc. is North America's largest professional Coffee Brewing system manufacturer and OEM supplier. It designs and builds the most technologically advanced coffee brewing equipment for top tier companies as well as the world's top coffee roasters. Aside from a long-standing tradition of providing consumers with the best coffee brewing experience, Cafection is dedicated to global sustainability and designs its equipment to produce only completely biodegradable waste. About this company Cafection Inc.